Celebrating feast of the Holy Rosary in India | Walk with us! ← Happy birthday in the Indian style! Last evening the entire community traveled the short distance from the novitiate house to Sacred Heart Parish in Nambur to celebrate the Feast of the Holy Rosary with the parish. We were invited by Fr. Ravindra Moparthi the assistant parish priest who has been acting pastor for the last month while Fr. Dharma Raju Akula, scj, has been in the US for a month-long introduction to how the US Province runs its financial office and fund raising. Fr. Dharma is joined in the States by Fr. Michael Benedict, the district treasurer and the two of them will be returning to India next Monday. The one lane bridge that we need to cross from the novitiate side to the parish side is partially closed and has been reduced to perhaps half a lane. The Sisters of St. Francis of Assisi of Ignatius Gonzaga, Br. Bapuji, one of the novices, and I all piled in and on a motor taxi to make the journey. Originally only a couple of sisters were to go with us but our driver learned the motor-taxi coming from the other side of the bridge was not able to make it over the bridge so our numbers increased. Well when we got to the bridge it was absolute chaos. It reminded me of how Italians can blur lines to the point it almost feels like every man for himself! The difference between the two cultures? Often in Italy when a traffic light went out someone would get out there and direct traffic and sooner or later everyone would obey as it was the best way to get traffic flowing. Alas no volunteers appeared at the bridge and no one would budge! We were at a disadvantage in that part of the bridge still open was on the side of the traffic going the other way and they just kept coming. After sitting there for about 10 minutes Bapuji and I got out and decided to walk the rest of the way to the Church. The walk took between 10 and 15 minutes and at least by then some of our brothers had managed to cross over. By the time Mass finally began everyone was accounted for. As you’ll note from the photo the Mass was going to be outdoors since the interior of the church would not be large enough to hold the expected crowd. There were eight of us who concelebrated. Fr. Ravindra did not as he was busy with practical matters from helping out the choir to arranging things needed at the altar. A local diocesan priest was the main celebrant with another preaching the homily. Other then guessing that he was talking about Mary since we were celebrating the Feast of the Holy Rosary there was nothing I could understand in his 45 minute homily. Well once in a while when he’d throw in a Praise the Lord, Alleluia repeated three times by him and the congregation I could understand that. At the end of Mass I was asked to bless a statue of the virgin which was then carried around the church in procession three times. 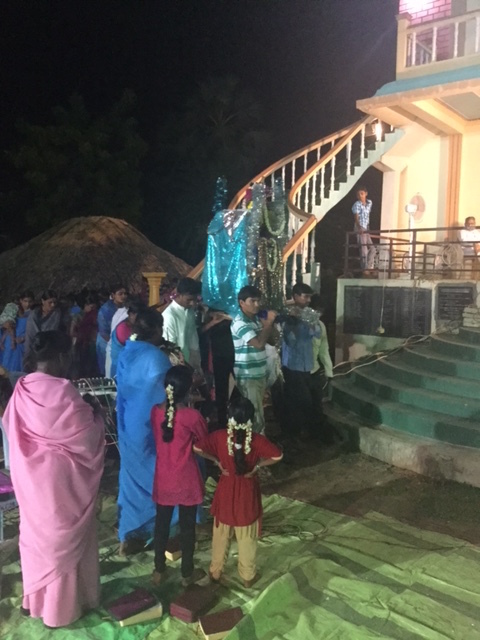 On the first go around four of the priests carried it to be replaced on the last two go rounds by men of the parish and some of our brothers from the novitiate as well. It was harder than it looks because the statute and platform carried some weight, but what made it more difficult was the uneven ground around the church. Gratefully there were no accidents and all who marched around were able to keep their footing — sometimes with a bit of assistance from those nearby. After the procession it was time to eat. Tables were set up in church and the first to eat were the priests and sisters. We on one side and the sisters facing us from the other side. Rice with chicken was the main course. Naturally all ate with their hands. I was offered a fork and spoon but by then I was halfway through my meal so declined to use them. Dinner done, Fr. Rino Jose and I were given a ride home by one of the parishioners. Since cars can’t cross the bridge we had to take the long way around a trip of about five kilometers (3.10 miles).